Also known as Spider flower, this plant will make the back of your border a focal point. Colors includes Helen Campbell (white), Rose Queen and Violet Queen. Airy 5-6" flower clusters on strong, sturdy stems. GARDEN HINTS: Grows best in full sun. Space 15-18" apart. Can be started indoors or outdoors. Direct sow seeds in average soil in full sun after danger of frost. Sow seeds thinly and cover with ¼ inch of soil. Thin plants to stand 8 inches apart when plants are 1 to 2 inches high. Thin again to 2 feet apart when plants are established. Keep soil evenly moist but not wet. Fertilize as needed with a slow release fertilizer designed for flowering plants. Plants can self-sow, so allow some to set seeds. Cleome is easy to grow and needs little care. Cleomes make striking, fast-growing annual hedges. Their thorns and dense foliage create an effective barrier, while prolific blooms create a pleasing mass of color. 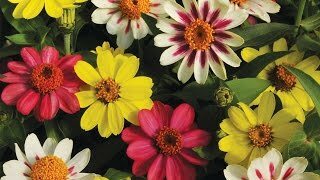 Add tall varieties to the back of an annual, perennial or mixed border for their long bloom periods and airy flower heads. You can use them to fill in between clumps of perennials, and they combine well with many shrubs. Cleomes also make interesting cut flowers. Cleome, Queen Mixed Colors is rated 2.8 out of 5 by 13. Rated 5 out of 5 by teresadddd from queen cleome i havent gotten them from you but i have some and they are really easy to grow. i take the seeds and save them until next year. the leaves almost look like a pot plant. ive been asked several times why am i growing pot? they grow so tall and take uo alot of room. they are low matience. i love this plant. Rated 5 out of 5 by Kevolbud from Nice new addition to the garden Others have stated they had problems sprouting them, I started them in pots and watered them with aspirin water (1.5 aspirin per 2 gal water) to start them. Then after they were well started I transplanted them to the South side of the house. They are spectacular and very unique. Rated 1 out of 5 by REDICO from Didn't grow a single plant I planted this mix in 3 different beds. It didn't grow a single plant. Rated 1 out of 5 by LauraH from None of the Cleome seeds sprouted. I planted several different types of seeds from your company. None of which have grown. I'm having better success from seeds purchased from "big box" stores. Rated 5 out of 5 by jhbriick from Wow!!! This has been blooming for almost 3 months! Planted it near some perennial grasses, look wonderful together. One tip, plant directly in soil when weather permits; seeds took off much faster than starting in seed trays. You won't be disappointed. Rated 1 out of 5 by crysta from So disappointed I bought these and planted them in two different places, none of them ever came up.